Kumkumadi oil : Kumkumadi is a unique blend of rare oils and herbs with pure saffron formulated to help skin look young ,healthy and spotless. This very rich oil and quick absorbing oil nourishes & adds radiance to the skin giving it an even tone. 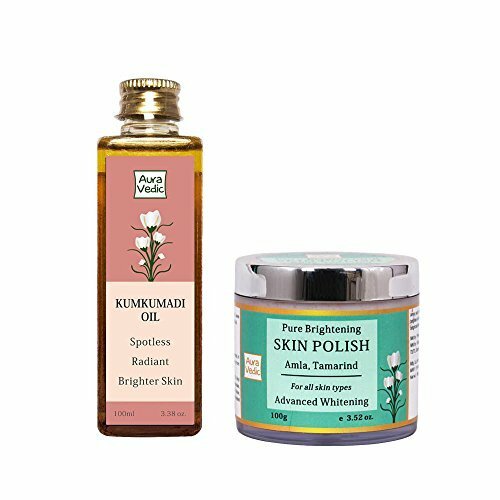 Skin Brightening Amla Polish : Amla pulp combined with red tamarind & jojoba seeds dissolve dead cells, brighten dull skin to reveal healthy and visibly brighter skin underneath. Reveal a bright and beautiful complexion! If you have any questions about this product by Auravedic, contact us by completing and submitting the form below. If you are looking for a specif part number, please include it with your message. Kaleidoscope Miracle Drops Hair Oil for Strengthen Weak Hair 2oz "Pack of 6"